Card games were a daily fixture of life at CAP 2-7-2, with poker and hearts played most frequently. These games could get very competitive. We broke up several fistfights triggered by disputes over cards. Best friends would be at each others’ throats. 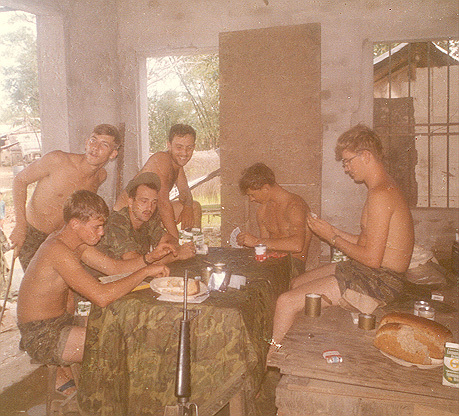 Players and kibbitzers in this game were, left to right, R.J. Carrier, Nelson Kilmister, Scottie Shirley, Frenchy Pelletier, Huck Prock and Ken Duncan.